According to the mainstream press there are emerging signs of life in the UK savings markets as the new tax year has kicked into gear, finally offering some hope to Britain's savers after a near 5 years of a catastrophic downward death spiral in UK interest rates, one of being ripped off by the tax payer bailed out banking crime syndicate that for the duration has continued to bank bonuses on the basis of artificial profits engineered by the Bank of England in an attempt at recapitalisng the bankrupt banks all whilst the savers continue to suffer and pay the price in terms of loss of purchasing power of savings by means of sub inflation interest rates. My tracking of the Halifax Cash ISA's illustrates the relentless collapse in UK savings interest rates. Firstly, the Halifax Mid 2016 withdrew virtually all of their fixed rate ISA accounts. However, to continue with this long standing series for when longer duration ISA fixed rates return, I have applied the percentage change on the 1 year fixed rate to fixes for preceding longer duration terms (in red) to illustrate what has happened to the UK savings market. Unfortunately for those already or seeking to save with the Halifax then there is NO SIGN of recovery from the ISA INTEREST RATES CRASH CATASTROPHE! The Halifax continues to throw scraps off its table to it's Cash ISA savers, this whilst the UK inflation rate has soared to 3.7% RPI and 2.7% CPI! Which means that the Halifax is definitely one of the top tax payer bailed out banks to avoid! Whilst the Halifax is a big fat fail, so are there any cash ISA providers that are managing to come anywhere near matching CPI inflation? Easy Access - Virgin Money 1.05% - 3 withdrawals per year. Note UBL accounts can be a pain to open i.e. sending forms, docs and cheque's by post. So your cash can be sat on account earning zero interest for nearly 3 weeks, whilst UBL processes your application. Current CPI is at 2.7%, so NO, ALL of the ISA providers are a big fat FAIL for not coming anywhere near even matching CPI Inflation let alone RPI at 3.7%! 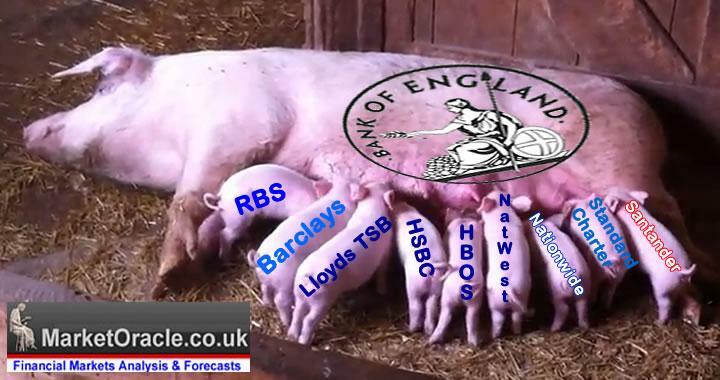 This is what happens when the Bank of England supports its banking brethren for over 8 years with printed money! all backed by Britain's sucker tax payers who continue to be fleeced of the purchasing power of their hard earned savings. The solution of course is to invest in assets that are LEVERAGED to central bank money printing, such as housing and stocks as I have covered extensively in over 1000 articles and videos over the years. Kent Reliance and the GREAT CASH ISA RIP OFF! Simply, cash ISA savers are being ripped off by ALL providers! For example pick any provider at random and you will see that the provider significantly under pays interest on the ISA accounts against the none ISA accounts for the same TERM. For instance Kent Reliance pays 1.80% on its 2 year fixed rate bond, and 1.7% on its 1 year fixed rate bond. Whilst Kent Reliance pays just 1% on its 2 year fixed rate ISA and just 0.9% on its 1 year fixed rate ISA i.e. Kent Reliance is paying nearly HALF the interest rate on ISA accounts than on the same term none ISA accounts! There is NO justification for this ! 1% paid to 2 year fixed rate ISA savers, whilst paying 1.8% to none ISA savers. IS A RIP OFF! Again this is just one provider plucked at random for the truth is all of the banks and building societies are ripping off their cash ISA savers, who like sheep are being led to the slaughter of the value of their life-time of savings.